Pigeons don’t tweet, they make cooing noises. They don’t wear backpacks either. Usually. Well, say hello to the new breed of backpack wearing, tweeting pigeons that might just save lives. If you live in a city there’s a good chance you’ll be sharing it most days with a large number of pigeons. And generally speaking, they don’t enjoy the best reputation. But don’t be so quick to judge, at least not the feral pigeon’s domesticated cousin. Pioneering new technology from a company called Plume Labs in France has allowed air pollution sensors with a wireless link to be strapped onto pigeons in order to sense levels high above the ground. Sensor readings are transmitted back down to ground based receivers in the city. 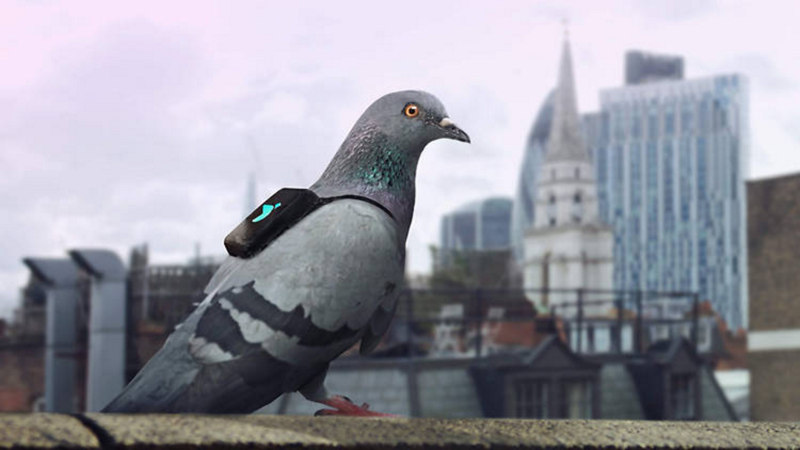 In 2016 a flock of ten trained racing pigeons were released over London wearing the tiny backpacks with sensors designed to gather and tweet real-time information about local levels of air pollution. In total data on air pollution is collected in 200 cities all over the world. The company then makes this information available on the internet. Air pollution is not always afforded the attention it deserves. It’s often invisible and its effects can take a long time to appear. It is often difficult to attribute a phenomenon like air pollution directly to a cause of death and so it is usually recorded as a contributing factor, if at all. It’s a silent but deadly killer but in a report issued in 2016, the World Health Organisation estimated that 8.2 million deaths per year can be attributed to noncommunicable diseases that are primarily linked to air pollution. That equates to more than 15 deaths per minute, 24/7/365. It is said that air pollution is the single greatest environmental health risk on the planet. So what can the LPWAN industry contribute to this project? Let’s have a look at some of the technical realities. It’s not clear which wireless technology is being used by Plume to transmit the data from the pigeon to the ground but we can surmise that it isn’t GSM (the backpacks are too small and the energy consumption too high for this to be practical). It is perhaps likely to be either Bluetooth or Wi-Fi and for the sake of this discussion comparing LPWAN and PAN, let’s assume that it is Bluetooth. What could be achieved in this scenario if we swapped out a Bluetooth link for a Weightless-P or LoRaWAN tech? First off we’d get an immediate range dividend and a single base station could cover a far wider area. In fact, in this unique use case we are considering a free space line of sight link with virtually no path loss. If the amount of recorded data it is larger, or the number of sensors is increased, or the transmission interval is reduced, then Weightless-P will be the better solution, because the MAC layer allows a far higher data throughput than LoRaWAN. Moreover, Weightless-P uses TDMA (Time Division Multiple Access – discussed in another blog) and LoRaWAN is using plain Aloha with 82% package loss. Weightless-P offers faster communications and a better radio access protocol. So next time you disparage the poor pigeon, at least console yourself with the fact that they are doing their bit to help us clean up our environment. Even if they do poop everywhere. If you are interested in an offer for the BOM or development of a IoT prototype or a product for mass production, then do not hesitate to drop an email to harald.naumann (at) gsm-modem.de . Advice, latest news and discussions on LPWAN (SIGFOX, LoRaWAN, Weightless P), LTE-Cat-NB1 (NB-IoT), LTE-Cat-M1 and further Low Power Technologies which cover at least one SubGHz bands dedicated for developers who plan a wireless device for the Internet of Things.